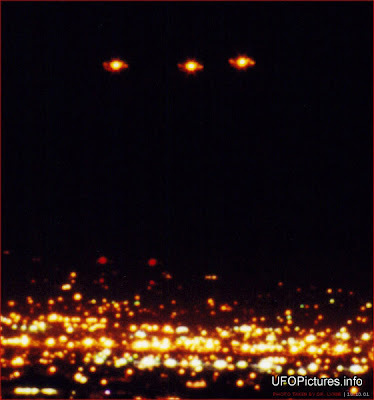 One of the most talked about cases in all of UFO history is that of 'The Phoenix Lights'. On March 13th, 1997 over ten thousand people saw a massive V shaped boomerang kind of a UFO, the size of 3 football fields drift across the state of Arizona creating one of the most spectacular UFO spectacles ever witnessed in modern times. 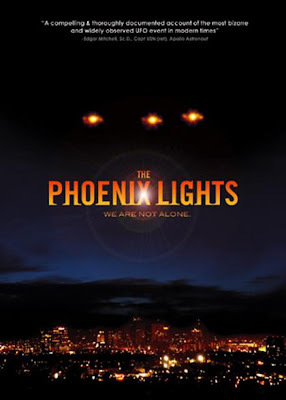 The Phoenix Lights - We Are Not Alone Documentary is based on the bestselling book, "The Phoenix Lights... A Skeptic's Discovery That We Are Not Alone", over 30 credible eyewitnesses reports from children, scientists, military, and experts, as well as NASA footage and the recent disclosure by former Governor Fife Symington, give compelling testimony to the reality of these mysterious unexplained visitations. The project is a collaborative effort between Lynne D. Kitei, M.D. (Executive Producer/Director, Author & Key Witness) and Steve Lantz (Producer, Director of Photography, Editor & Composer). The inexplicable and awesome event was witnessed by thousands of people, while they were looking up at the sky, purposely to catch a glimpse of the Halle-Bopp Comet. The significant statewide incident garnering headline news, catching the attention of USA Today, CNN, MSNBC, The Discovery Channel, EXTRA, national morning TV shows, as well as the Evening News with Tom Brokaw and Dan Rather. UFO buffs call it the most documented and important mass sighting ever recorded. But still today, the military and government can only offer questionable explanations as to what the anomalous lights truly were. In over 10 years, the strange phenomena have never been duplicated or re-enacted [although the military tried fruitlessly, three years later]. Many experts and witnesses insist that what appeared in the Arizona skies was something beyond this world. "The Phoenix Lights : The Discovery Channel Documentary"
Eyewitness Accounts Though the huge lighted formation seemed to move in a tauntingly slow speed over Arizona, it was reported that strange lights had sped from the Henderson-Las Vegas, Nevada area toward Arizona, and seemed to slow down as it entered the Arizona area. Initial reports described anywhere from 5-7 points of light, and ultimately 8 with a trailing ninth. The enormous object was extremely low, and mountainous areas could be seen behind the craft in pictures, therefore giving photographic experts scale to approximate the elevation from the ground, and the distance from the camera. This would enable an estimate of the craft being a whopping one mile or more in length! The color of its lights were described as "blue-white," to "yellow-white," to "amber." Again, these differences of description do not necessitate there being more than one object. During the crafts fast moving period, it was estimated to be moving at Mach 2-3. As it slowed down as if posing to be filmed, the speed dropped to an estimated 10-15 MPH. At one point over Sky Harbor, it reportedly hovered for several minutes. The object was also reported to change shapes, speeds, and colors, as it made its way across the skies of Arizona. Between 9:00 and 9:30 PM on the 13th, one extraordinary description was made by a family in Mesa. They said that an enormous craft with a distinctive structure flew over their area. They described a triangle-shaped object with lights at the three corners, and another larger light in its center. Amazingly, they could clearly see panels on the craft which were in a grid pattern. There were also, about this same time, several reports of two round objects which seemed to detach from the larger "V" shaped object, only to later rejoin the mother-ship. One witness described the "V" shaped mother-ship dividing itself into two separate craft as it moved toward the city of Tucson. Another dramatic description of the mother-ship was made by a group of real estate agents who had subdivided property over the northern part of Phoenix. They would also get a close-up view of the gigantic disc. They estimated the craft to be a staggering two miles wide as it flew at a low altitude near Phoenix. They could see dozens of bright lights along the leading edges, and also a row of windows with "silhouettes of people." It also seems highly probably that for some reason, the giant craft turned off its lights, as observers could see only the windows with what appeared to be people shadowed in the glow of the inside. Another family got a brightly lit view of the unknown object, and described its color as "flat blue-black, like the color of a shotgun barrel." Among the most reliable witnesses of the craft's movements that first night were two airplane pilots, one retired from an airline, and another from Vietnam, who was also a U. S. Marshall. Though seeing the object at different times and places, both men described a craft of "immense size," measuring up to a mile long. The Marshall could also see the city lights of Phoenix reflecting from the bottom of the massive object, while it "blocked out the stars." One of the pilots also videotaped the UFO, but had the tape confiscated in a "men in black" encounter. In a completely separate incident, a group of witnesses had reported a "huge discoid" craft which was "larger than Sun Devil Stadium at Arizona State University." This object was hovering just above tree tops at the west end of Sky Harbor runway between 2:00 and 3:00 AM about two weeks prior to March 13. Military Involvement It was almost inevitable that the United States Air Force would become involved in an event of this magnitude, and the Phoenix lights mystery would be no exception. While driving down Interstate-I-17 from Camp Verde, a truck driver had been seeing two amber colored UFOs moving ahead of him southward for two whole hours. His destination was a materials plant near Luke Air Force Base. Upon arriving there, the two UFOs hovered nearby. While his truck was being loaded, the driver walked upon a pile of materials to get a better look at the two UFOs. He could make out two identical "toy, top-like amber orbs" with a white glow to them. 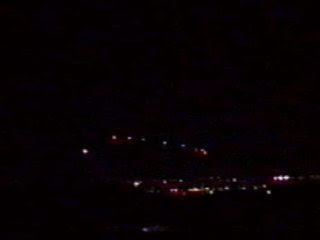 A band of red lights pulsated on the craft as it hovered near the Luke AFB runway. Suddenly, two F-16s "blasted out of Luke with their afterburners on full." Soon, a third plane followed, and all three made a direct run toward the hovering UFOs. As the first two jets were about to reach the UFOs, the unknown objects shot straight upward, and disappeared "in an instant." The two jets flew right through the exact spot the UFOs had previously occupied. A Luke ground crewman later confirmed to NUFORC that the driver's account was true. He also stated that upon returning to the base runway, one of the pilots had to be helped from his cockpit. He was visibly shaken from what had just happened. According to Peter Davenport of the NUFORC one of the more intriguing reports was submitted by a young man who claimed to be an Airman stationed at Luke Air Force Base, located to the west of Phoenix in Litchfield Park. He telephoned the National UFO Reporting Center at 3:20 a.m. on Friday, some eight hours after the sightings on the previous night, and reported that two USAF F-15c fighters had been “scrambled” from Luke AFB, and had intercepted one of the objects. Although the presence of F-15’s could never be confirmed, the airman provided detailed information which proved to be highly accurate, based on what investigators would reconstruct from witnesses over subsequent weeks and months. Two days after his first telephone call, the airman called to report that he had just been informed by his commander that he was being transferred to an assignment in Greenland. He has never been heard from again since that telephone call.